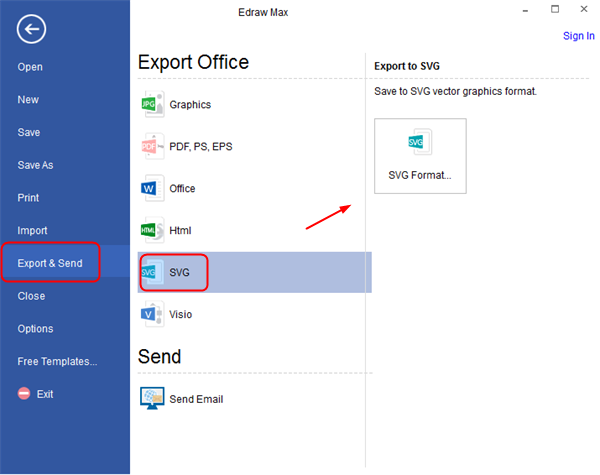 Learn how to export other image formats to SVG that is optimized for web. This software has a professional way of generating high quality SVG. SVG (Scalable Vector Graphics) is a text-based graphic language that can describe images with vector shapes, text, and embedded raster graphics. It is an image format that allows to draw two-dimensional vector graphics for the use of websites. What is the Advantage of SVG? Image Quality: SVG images are created as vectors, so image quality will not be effected while resizing and scaling. This makes the images still clear for viewing when zoomed in or zoomed out. Open Standard SVG is an open standard just like Flash which make it accessible to everyone. Search Engine Optimization Basically, SVG is defined in XML format, and XML is simply plain text. Almost all search engines have SVG support, SVG images can be searched and indexed. 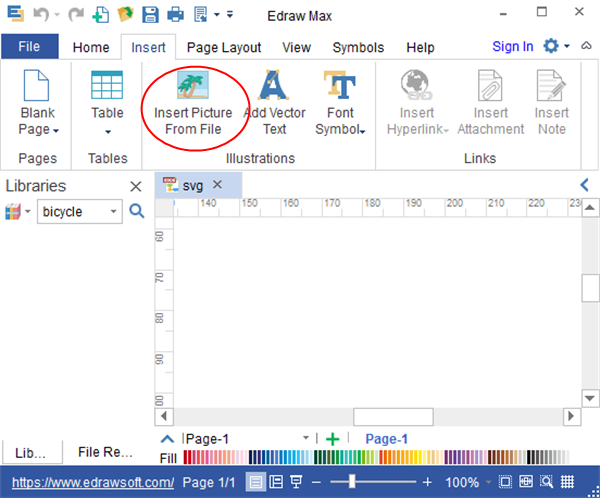 Edraw has a great compatibility which allows you to export images in other formats to SVG within just a few clicks. There are two options to complete this task. Follow the instruction below and convert a ready-made image to SVG. 1. Download Edraw Max for free, then launch this software. 2. Click on "Insert Picture Form File" on drawing page, and insert the image that needs to be converted into SVG. Open a blank drawing page and insert the image. Option one is for exporting ready-made images to SVG through this powerful software. With this function, Edraw can convert all kinds of image formats, JPG, PNG and GIF, etc. Edraw provides a set of vector shapes from a wide variety of business charts, clipart and presentations. Just open a blank drawing page, drag and drop the ready-made shapes form libraries. It couldn't be easier. Here are some of the vectors provided on Edraw. Now that you have the image needs to be converted on Edraw, here is how you should do to export the image to SVG. Under the "File" menu on the drawing page, choose "Export & Send" - "SVG", you will get your image successfully converted to SVG format.